4) when we expressed our consumers opinion we were faced with agression and sheer ignorance. We believe expressing your opinion would help the restaurant make improvements. This restaurant is over overpriced for the quality of food. One postive is the decor is beautiful. I went there with a group of friends on a Saturday to enjoy a nice dinner, and the place exceeded my expectations. Once you are inside you feel you are in Marrakesh, the atmosphere was cozy and very friendly. The food was excellent, and they even had a bellydancer. A perfect Saturday night, will definetly come back. 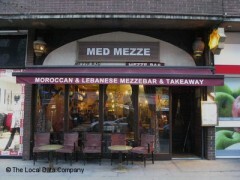 Med Mezze has possibly the best prices for the quality of food that it offers.